Omega 3 enriched chicken - available exclusively at Waitrose. 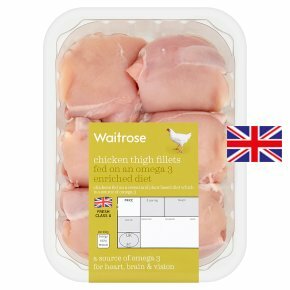 Waitrose boneless and skinless British chicken thigh fillets, naturally enriched with Omega 3. Our British chickens are fed on a diet enriched with Omega 3, resulting in the same delicious, lean and versatile meat with additional health benefits which are passed on to you. Omega 3 essential fatty acids help to maintain normal functioning of the heart, brain and vision as part of a healthy, balanced diet and lifestyle. All our chickens are raised with care on British farms, by farmers who share our values. Pan Fry. Time: 12-15 mins. Remove all packaging. Heat 1 dessertspoon of oil in frying pan, add chicken and cook on high to seal, turn and seal other side. Reduce heat until thoroughly cooked, the juices run clear and there is no pink meat. Suitable for stir fry. Do not reheat once cooled.